"China uses foreign ownership restrictions, including joint venture requirements, equity limitations, and other investment restrictions,"
"China imposes substantial restrictions on, and intervenes in, U.S. firms’ investments and activities"
"China directs and facilitates the systematic investment in, and acquisition of, U.S. companies and assets by Chinese companies"
Cybersecurity: "China conducts and supports unauthorized intrusions into, and theft from, the computer networks of U.S. companies." This action has become global news in politics, technology, and business domains as the impact of these actions are assessed. In the video surveillance market, China has become a major global force. Led by Chinese government-owned Hikvision, China has become the biggest global market for video surveillance, with the biggest manufacturers. But how will the US memorandum impact video surveillance supplier and buyers? In this note, we examine the factors in play. The most notable point is that the tariffs are not yet set and are part of a negotiation process (e.g., the threat of tariffs may prompt concessions from the PRC, which Chinese state-run media has acknowledged as an option). By April 6, 2018 (15 days after the memorandum issued), the US will "publish a proposed list of products and any intended tariff increases". 1,300 products are being targeted but what they specifically are has not been disclosed. After the list is published, US industry will have 30 days to review and respond, with an expectation that the list would be 'watered down'. large, low-interest loans from state-owned investment funds and development banks; assistance in buying foreign competitors; and extensive research subsidies, all with the goal of making China largely self-sufficient in the targeted industries. the Chinese government’s plan says Chinese industries that benefit should own as much as 80 percent of their home market in just eight years. lead to government-subsidized global players that would compete unfairly. This, unsurprisingly, accurately describes the situation in the video surveillance market. The US is focusing its tariffs on 10 industries part of the "Made In China 2025" program as explained in the US Senate finance committee hearing (57 min mark). Video surveillance falls under the "advanced information technology" industry segment of the program. 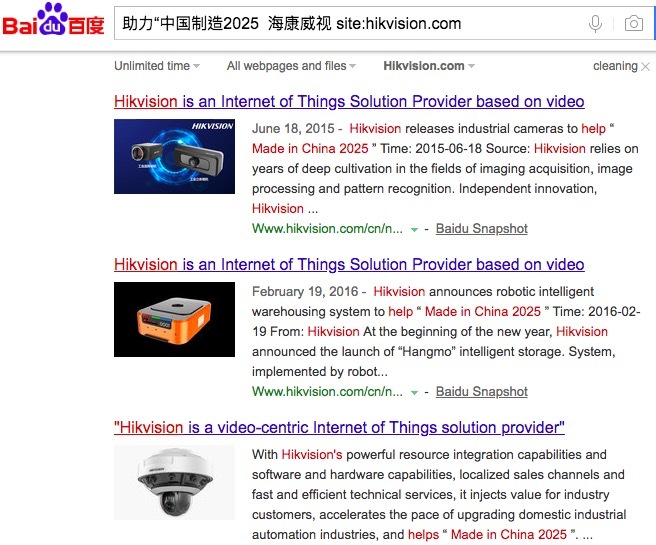 Hikvision Major Beneficiary of "Made In China 2025"
Indeed, Hikvision's Chairman (who recently joined the Chinese national government) has been touting Hikvision's progress with "Made In China 2025" program on Hikvision China's website in 2016 and Hikvision's government owner website this month. Cameras and Recorders Impacted by Tariffs? It is hard to determine if 'regular' cameras and recorders will be impacted by these tariffs. Will the US government categorize them as 'advanced information technology'? Is the cybersecurity risk of these products significant enough to warrant inclusion based on those concerns cited in the memorandum? On the other hand, deep learning and AI are almost certainly going to appear on the list as they are core components of emerging technology. Even if the tariffs are enacted here, the question will be how much of an impact 25% will be for these products. The willingness of Dahua and Hikvision to sell at greatly reduced prices and with greater marketing spend than their Western competitors is clear. 25% is likely to close the gap somewhat but given how early deep learning is for video surveillance it is hard to determine the exact impact. Indeed, it still remains to be seen how well their deep learning works. The negative case for the US: Trump, being divisive, could make the United States be seen as a bully against China plus imposing a tax 'against' American consumers. 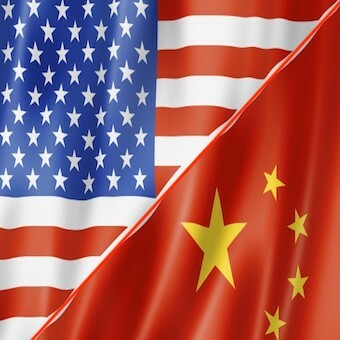 This could effectively backfire, allowing the PRC to go forward with no tariffs applied, a backlash against the US and a clear path for continued Chinese manufacturer international expansion. The positive case for the US: These actions could engender a greater awareness of the unfair and anticompetitive practices that China has pursued for years that have damaged various foreign countries companies, worsening as China's economy has become larger and the country has become more authoritarian. This could motivate more buyers, regardless of tariffs, to prefer non-PRC products. It is too early to determine the ultimate impact but the stakes and attention have just gotten much higher. Comments (60) : PRO Members only. Login. or Join.